Words and music have always had a close association. I suppose songs are the most obvious example and further back in musical history the chants of the early medieval church. They could have been spoken of course and doubtless were, but singing the words made them not only easier to memorise but a good deal more pleasurable and fulfilling to perform. Generations later, during the European romantic era, it became fashionable to use poems not merely as a text for setting but as a starting point for an independent composition. The two works this week have their origins in poetry. In many ways, they are opposites because whereas one of them looks forward into the twentieth century, the other looks backward to a bygone age. Debussy took a poem by the French symbolist Stéphane Mallarmé about a faun and the English 20th century composer John Tavener took a poem about a lamb by the great Romantic artist William Blake. Debussy’s work is a broad, rhapsodic orchestral piece of incredible complexity while Tavener’s choral piece is remarkable in its simplicity. The faun is a half-human, half-goat with its upper section being human apart from a pair of small goat horns on its head. The origins date back to Greek mythology but the Romans kept the faun tradition alive and believed that they lived in wild, remote places. They would evidently help or hinder humans depending on their frame of mind. Mallarmé’s famous 1876 poem describes the sensual experiences of a faun who has just woken up from his afternoon sleep. 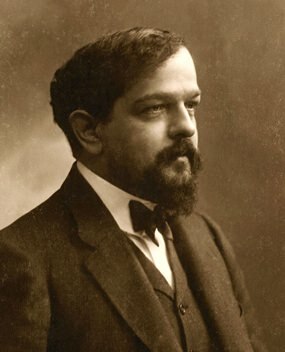 The poem came to the attention of Debussy who in 1894 crafted his extraordinary orchestral work. Although this composition was years ahead of its time, the opening flute solo must be one of the most famous passages in the orchestral repertoire. Pierre Boulez has said he considered the score to mark the beginning of modern music. It was one of the most significant musical works of its day, consisting of a complex organization of musical cells and motifs. It’s not actually descriptive in the usual sense of the word but it uses rich whole-tone harmonies, daring orchestration and to contemporary audiences must have sounded very modern indeed. Leonard Bernstein wrote that the work “stretched the limits of tonality” and in so doing, set the harmonic stage for the atonal music of the century to come. In this recording, Bernstein conducts the Orchestra dell’Accademia Nazionale di Santa Cecilia, one of the best-known orchestras in Italy. Confusingly, there are two English composers with almost identical names. The first John Taverner had two r’s in his surname (but not always) and lived from 1490 until 1545. The twentieth century John Tavener has claimed to be his direct descendent. He came to public attention with his cantata The Whale, first performed in 1968 and he’s become one of the most popular composers of his generation with a huge output of religious music. He’s perhaps best-known for a haunting work for cello and orchestra The Protecting Veil, and for the Song for Athene which was performed at the funeral of Princess Diana. The Lamb is a setting of a short poem by William Blake and gives us a glimpse into Tavener’s highly personal sound-world. It’s written for unaccompanied four-part choir and is deceptively simple, yet the moving vocal parts produce unexpected dissonances that seem to evoke the music of Eastern Europe. Dedicated to his nephew’s third birthday, the piece is often performed as a Christmas carol but like so much of Tavener’s music, it has a compelling sense of timelessness. This piece has been recorded on nearly forty CDs and has become a classic in its own time.